Mission Team from Jamestown, NY and Cincinnati, OH. Bringing glasses and eye clinics to the people of Uganda! Today began with a leisurely breakfast while we waited for some work to be done on the van. Morning turned into afternoon before we headed off to Gulu, a village in the northern part of Uganda. The eight hour trip was filled with the smells of smoke, dust and exhaust. Some of the sights along the way included a variety of small stores and markets, goats and long-horned steers, stereotypical huts and people carrying anything and everything on their heads. It's incredible to observe how many things can be strategically balanced on a bicycle or motorcycle! The severe rattles of the van were headache-inducing and the bouncing has the potential to shake any loose! : ) We took a little snack and bathroom break (oh the joys of the "squatty potty"!) about halfway into our trip. The most famous landmark that we witnessed was the Nile River! It was gorgeous and majestic, powerful and wide. The journey was long, especially the second half, because the road was so treacherous. I kept pretending we were off-roading:) just imagine traveling down the worst dirt road in Pennsylvania - now add large potholes, numerous trucks, motorcycles and people! As darkness descended the intensity of the driving increased. We are so thankful for our trusted and experienced drivers, who were able to negotiate the road with great skill. We finally pulled in to our hostel (mini hotel) where we would be spending the next three nights. I can't tell you the relief and excitement we felt when we saw that we had nice rooms with their own bathrooms with a REAL toilet! We dropped off our things and headed to the Gulu Church of GOD where we would be conducting the workshops. The ladies there had prepared supper for us, which we ate right in the church building by the light of a kerosene lamp. I am reminded that life can be like this ride: full of adventure, bumps, beautiful sights and not-so-beautiful smells. Sometimes the road is smooth, pleasant and easy. Sometimes it's so rough you feel like you've been beat up. But whatever the case my job as passenger is to embrace and enjoy the ride, and trust the driver. In our case it was our drivers, Sunde and Moses, but in life it is GOD. The journey isn't always easy. It may feel out-of-control, and even frightening sometimes. But in the end there is a great reward. 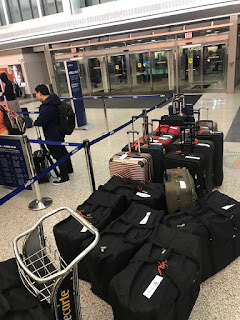 Buffalo Airport prep... we put white duct tape on 24 pieces of luggage for the baggage check, and orange yarn on all our belongings. Each helped by taking a carry-on of fragile medical equipment. We’re praying all will arrive in good stead. Oh, the thrill of being in the air again... witnessed spectacular colors as they edged over the eastern horizon! From JFK to Dubai Airport, we’re on a double decker plane, ten people per row, two aisles separating. We’re enjoying the camaraderie of our group, and people-watching. I was struck again by the vast cultural differences. Everything is in English and in Arabic, that beautiful language that looks like art. Between all crew members, they speak a total of 18 languages! 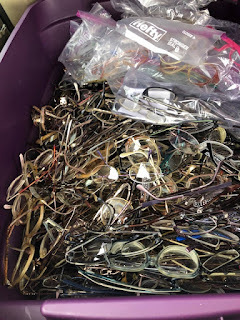 Eyeglasses: oodles and oodles of eyeglasses. I never realized how much I take my sight for granted. People in third world countries don’t have access to eye care like we do. Eyes get infected, yet not treated. Eyesight deteriorates, yet no intervention given. They don’t have government programs to give aid, no social workers to come alongside. If there are no family members to help, then there is no help. In seven weeks, our Uganda Team will depart with thousands, yes, thousands of eye glasses and an eye doctor. We’ll conduct eye clinics where people can have eyes tested with a focometer and a prescription matched. It’s a giant effort, but allows us to be the hands and feet of Jesus to bring sight to the blind and Good News to all. Sunday March 17: I guess it’s actually continuing the work. If you know us you know we have been preparing for a few months now. Once we pulled out of the driveway Friday morning to drive to Buffalo, it was too late to squeeze in one more thing in to do. The SUV was full to the brim with the suitcases for our clothes etc but also equipment. Sunday ... Therefore as you have received Christ Jesus the Lord, so walk in Him, rooted and built up in Him and established in the faith, just as you were taught, abounding in Thanksgiving. Col. 2:6,7.